WLA Christmas Concert 2007 "Tidings of Comfort and Joy"
Click to download a PDF file of the 2007 Christmas Concert program. Listen to WOSH 1490 AM on Christmas Day! WE'VE GOT THAT SHOW SCHEDULED FOR APPROXIMATELY 6:45 TO ABOUT 7:30 TUESDAY MORNING. THAT SEGMENT WILL REPLAY AT 5:45 TUESDAY NIGHT AS WELL. Tell your family and friends! WLA is on the air (1490 AM) on Christmas Day! 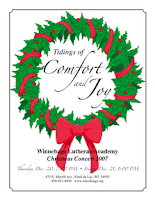 I got a phone call yesterday from a very nice gentleman at WOSH radio in Oshkosh, WI asking if I had any recordings of WLA students playing or singing Christmas music. WOSH 1490 AM will be airing recordings of local (yes, Fond du Lac is local to Oshkosh!) high school Christmas concerts on Christmas Day. So, I sent him the recording of WLA's 2006 Christmas Concert "Night of Miracles, Night of Grace". Watch this post in the coming days to see when on Christmas Day you can listen to WLA choirs and band on WOSH 1490 AM. In a slight change to the original singing schedule, Traveling Choir will sing in TWO SERVICES this Sunday, Dec. 16, 2007 at St. Paul's, Mt. Calvary. Pastor Barenz notified me a couple weeks ago and a concerned dad called WLA this week to remind us that there are two services at St. Paul's, Mt. Calvary: 8 and 10 AM. Traveling Choir will sing in both services. Students riding the bus should be at WLA by 6:15 AM. The bus will leave at 6:30 AM. Students driving by car should be to St. Paul's by 7:00 AM. GET TO BED EARLY SATURDAY NIGHT! The Traveling Choir will sing at St. Peter's, Eldorado this Sunday, Dec. 9, 2007 in the 9:00 AM service. Students traveling by car should be at the church at 8:00 AM. Students traveling by bus should be at WLA by 7:15 AM. The bus will leave WLA at 7:30 AM and be to the church by 8:00 AM.